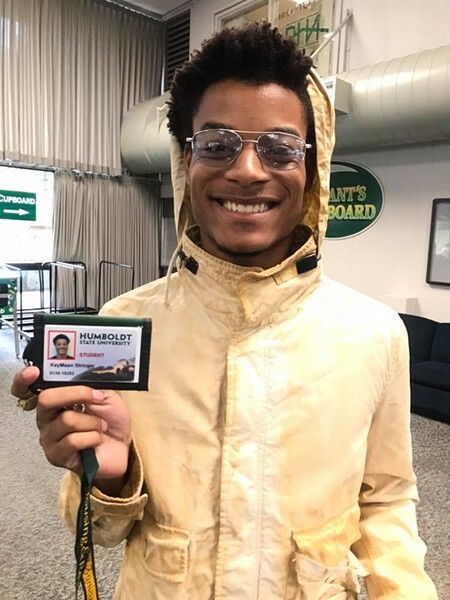 When professor Rae Robison first met KeyMaan Stringer during the orientation for incoming students in Humboldt State’s Department of Theatre, Film and Dance in August, the 19-year-old freshman immediately stood out. He was just “the sweetest person ever,” she said of Stringer, who arrived in Humboldt County from Los Angeles to begin classes just two months ago. The U.S. Coast Guard scoured 160 square-nautical miles for 16 hours before suspending the search for Stringer, who was swept off the North Jetty while fishing with fellow students Monday afternoon. Humboldt State University is proving counseling for members of the campus community who need assistance. Find more information here. Read an expanded story about Key’Maan Stringer and the lives he touched in his short life here. Robison said she had been trying to get in touch with Stringer for about a week to schedule a time to sit down and talk about his plans for next semester.